"I have a simple idea that crosses political and geographical boundaries, appeals to young and old alike and has very little to do with Brexit. The first political party which adopts it into their manifesto will surely be onto a winner. So what could it be, this idea with the potential to achieve all this? A pledge to support a bookshop in every town. That's it. I told you it was simple. However, a bookshop is much more than a straightforward retail outlet. It is a magical kingdom, a beacon on any row of shops, a venue to meet friends. 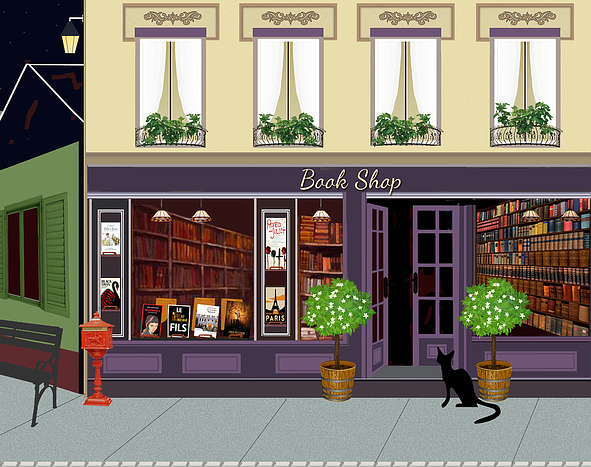 And if it is a good bookshop, it will seem as if nothing bad can ever happen within its walls. I get the feeling that this kind of sanctuary will be much needed in the coming months. What better time, then, to push for it on the agenda?" --Jayne Dowle in a Yorkshire Post article headlined "Backing a bookshop in every town would be an easy vote-winner in troubled times"
The first full day of the 14th Winter Institute yesterday included a range of panels, meetings, lunches, parties, dinners and what ABA CEO Oren Teicher likes to call the secret sauce of the event: the mingling and informal discussions among booksellers from across the country and around the world. This morning's main event: a breakfast featuring Margaret Atwood in conversation with Erin Morgenstern. 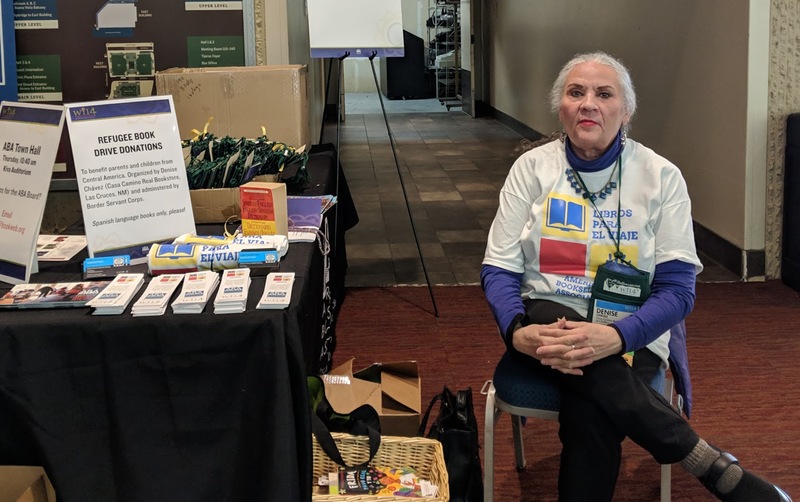 Denise Chávez of Casa Camino Real Bookstore, Las Cruces, N.Mex., organizer of a refugee book drive to benefit parents and children from Central America and Mexico, reported that many booksellers were donating Spanish-language books. The drive, which continues through Wi14, is being administered by Border Servants Corps. Check out suggested titles here. 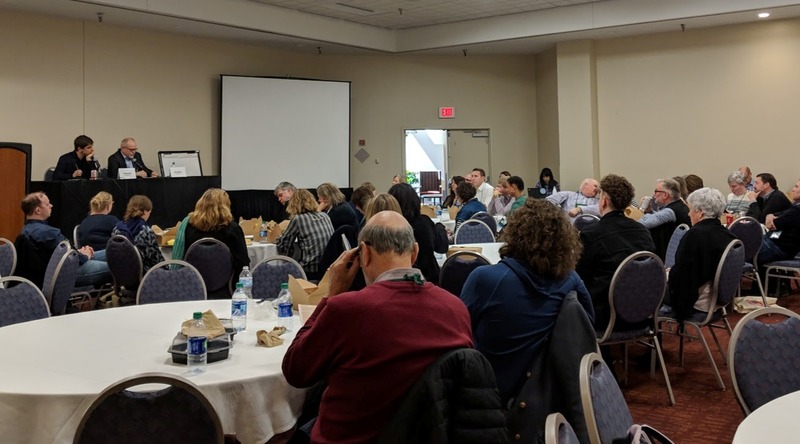 International guests met for a lunchtime discussion about the current state of the American book business, with speakers Ed Nawotka of Publishers Weekly and John Mutter of Shelf Awareness. At the Your Landlord, Your Business Partner panel, booksellers discussed best practices for dealing with landlords and leases: (l.-r.) Michael Tucker, Books Inc., San Francisco; Scott Abel, Solid State Books, Washington, D.C.; Jill Hendrix, Fiction Addiction, Greenville, S.C.; and Annie Philbrick, Bank Square Books, Mystic, Conn., and Savoy Bookshop & Cafe, Westerly, R.I.
Night owls at Scholastic's YA Fest after party (l.-r.): Scholastic's Susan Flynn and Mallory Kass; authors Bill Konigsberg, Sabina Khan, Lamar Giles and Jennifer Donnelley; and Scholastic's Nikki Mutch. "There is a tradition here in New Mexico to begin meetings and events such as ours with a blessing," said Robert Sindelar, ABA president and managing partner of Third Place Books, with three stores in and near Seattle, Wash., to begin Wednesday morning's breakfast keynote. He then introduced Max Early, a Native American poet and potter who shared a greeting in his native language and read three poems, including one that delved into his work as a potter. "Just let it go, never mind," Early said of the trial-and-error process. "Even though a piece might break on you, it's part of that creative essence. Just keep going, persevering." Sindelar observed that Early's words were "a wonderful way to ground us this morning. The metaphor of taking care of a broken pot and persevering is certainly in keeping with the spirit of bookselling." 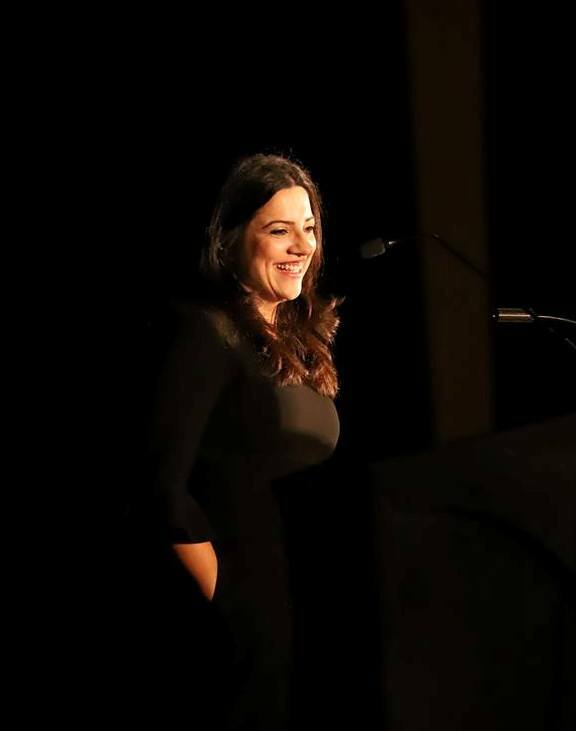 ABA v-p Jamie Fiocco, owner of Flyleaf Books, Chapel Hill, N.C., introduced keynote speaker Reshmi Saujani, author of Brave, Not Perfect: Fear Less, Fail More, and Live Bolder (Currency, February), as well as two previous titles: Girls Who Code and Women Who Don't Wait in Line. She is also founder and CEO of Girls Who Code. In keeping with the theme, Saujani shared the "little secret" that she had been struggling with her own perfectionism because she was giving a new speech: "So thank you for witnessing my bravery today." When she was a child, Saujani's father read to her from "these wonderful Reader's Digest picture books" about people like Dr. Martin Luther King, Mahatma Gandhi and Eleanor Roosevelt. "So from the time I was a little girl, I wanted to give back." But her life took a different path to a Yale law degree and a job at a New York City law firm. Then, at 33, she made a transformative decision. "Up until that point I was the perfect immigrant daughter," Saujani said. "My obsession with perfection had made me forget what I really wanted to do." She remembered that young girl who had been so clear about her destiny. In 2008, she watched Hillary Clinton say, in her first concession speech, "Just because I failed doesn't mean you shouldn't try, too." "I literally thought she was speaking to me," Saujani recalled. She quit her job and ran for the U.S. Congress against an 18-year incumbent. She "lost miserably," despite spending what she described as some of the best months of her life. At the "victory party," she took stock: she was broke, felt humiliated and had no contingency plan. "I tell you this story not because I want you to feel sorry for me... but because I was 33 years old, and when I ran for Congress it was the first time in my life that I had done something that was truly brave," she observed. "Before that, I thought that if I tried something and failed, that that failure would break me. And I know I'm not alone here, especially in this room. 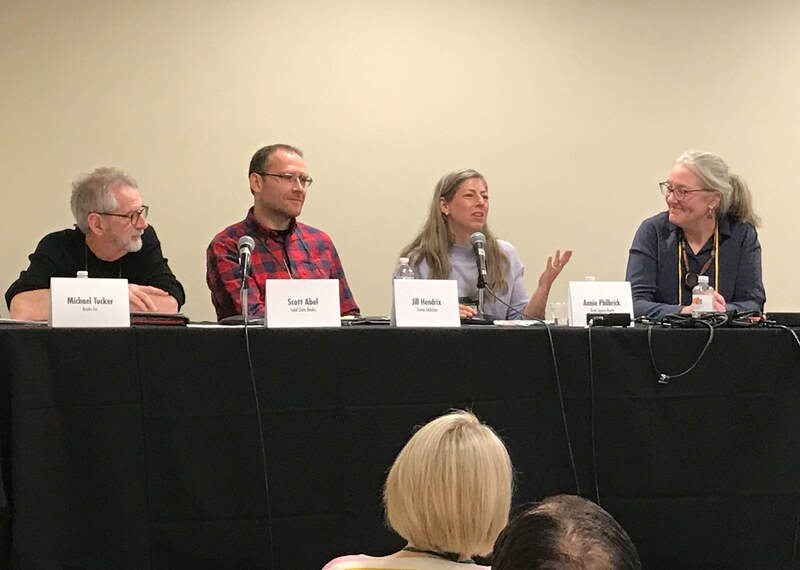 I've had the opportunity to talk to some amazing indie booksellers, and I know it's not easy, and that this fear of failure looms so large for so many of you. And the stakes are high when you're running up against high rent or Amazon, low minimum wages." "If you're terrified of messing up when you try something new, what does that mean for the rest of your life?" Saujani asked, addressing several myths of perfection and noting: "Women especially suffer from perfectionism, and so much of it has to do with the way we were raised." She cited her 2016 TED Talk, "Teach girls bravery, not perfection," adding that "a lot of people in this room can relate to what I'm talking about. Somebody may have been told that you were crazy to open an indie bookstore, but you did it anyway. You chased your dream anyway." She said "bravery is what succeeds in the workplace." Regarding her first book, Saujani said, "I learned that in many ways in teaching girls to code, I also taught them how to be brave.... For those of you who have ever coded, you know that it's an annoying process. If that semicolon's in the wrong place, you have to do it over and over. As nearby bookstores have closed over the past few years, Pegasus Book Exchange in Seattle, Wash., has seen its revenues jump year-over-year and has increasingly become a destination for new books, West Seattle Blog reported. While the majority of the store's inventory is still used books, the shop has slowly been expanding its stock of new books. Long-time employee Eric Ogriseck reported that in particular, Michelle Obama's Becoming was a "game-changer" for the store. Since its release, Pegasus has sold some 180 copies, which is unprecedented for the store. Pegasus Book Exchange also ordered more copies of Becoming for the holidays than it ever had for a new title. He added that this year the store will likely expand its new book inventory by another 10%. Ogriseck attributed some of the increase in new book sales to the closure of the neighborhood's Barnes & Noble, which officially shut its doors on January 12. And in January 2018, Merryweather Books, an indie bookstore located just up the street from Pegasus, closed. 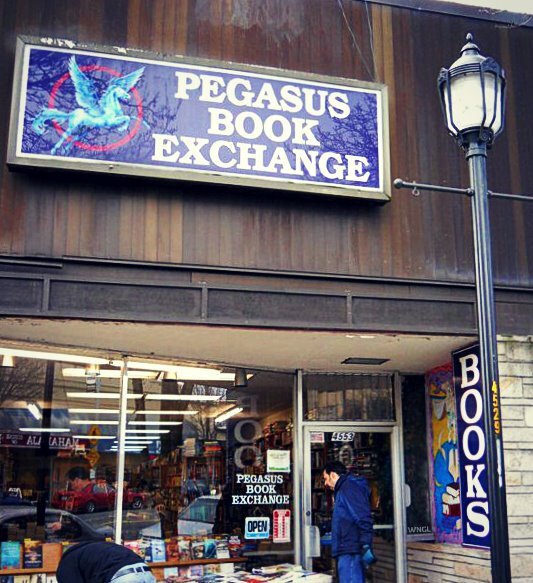 According to West Seattle Blog, Pegasus is the last surviving bookstore in the neighborhood. Fred and Lanthe Epps have owned Pegasus Book Exchange for nearly 40 years; their daughter Emma Epps manages the store. Russell Baker, the Pulitzer Prize-winning author "whose whimsical, irreverent 'Observer' column appeared in the New York Times and hundreds of other newspapers for 36 years and turned a backwoods-born Virginian into one of America's most celebrated writers," died January 21. He was 93. The Times noted that Baker, "along with the syndicated columnist Art Buchwald (who died in 2007), was one of the best-known newspaper humorists of his time." His son, Allen Baker, said, "We couldn’t have asked for a better father. He was a tender and loving man to his family.... He was just a Regular Joe with an extraordinary job." After an early career that included stints as a police reporter, rewrite man and London correspondent for the Baltimore Sun, then a Washington correspondent for the Times, Baker became a columnist in 1962. He wrote nearly 5,000 "Observer" commentaries, which "generated a devoted following, critical acclaim and the 1979 Pulitzer for distinguished commentary, ended with his retirement in 1998." He subsequently wrote essays for the New York Review of Books, some of which were collected in Looking Back. Regarding his columns, he once told Nora Ephron: "Nobody knew what the column was going to be. I didn't. The Times didn't." Baker published 15 books, including many column collections: No Cause for Panic (1964), Baker's Dozen (1964), All Things Considered (1965), Poor Russell's Almanac (1972), So This Is Depravity (1980), and The Rescue of Miss Yaskell and Other Pipe Dreams (1983). Baker's memoir Growing Up (1982) earned his second Pulitzer, the 1983 prize for biography. Baker also won two George Polk Awards, for commentary in 1978 and career achievement in 1998, and many other honors. In addition, he edited the Norton Book of Light Verse (1986) and Russell Baker's Book of American Humor (1993). "To a generation of television watchers, he was also a familiar face as the host of Masterpiece Theater on PBS from 1993 to 2004, having succeeded Alistair Cooke," the Times noted. In a tribute, Pulitzer Prize administrator Dana Canedy observed that Baker "was one of the first American writers to win Pulitzer Prizes in both Journalism and Letters. He was a distinguished member of the Pulitzer Prize Board, who served as its chairman in 1994, and who delivered the keynote address at the Prizes's 75th Anniversary Celebration in 1991. We join the rest of the country in recalling and celebrating his life, characterized by wit, charm and erudition." "The classiest and most talented," Maureen Dowd tweeted. "Once, when some male pols were giving me a hard time, he wrote me a letter telling me not to get overwhelmed: 'Just remember, these are all the same guys you went to high school with.' 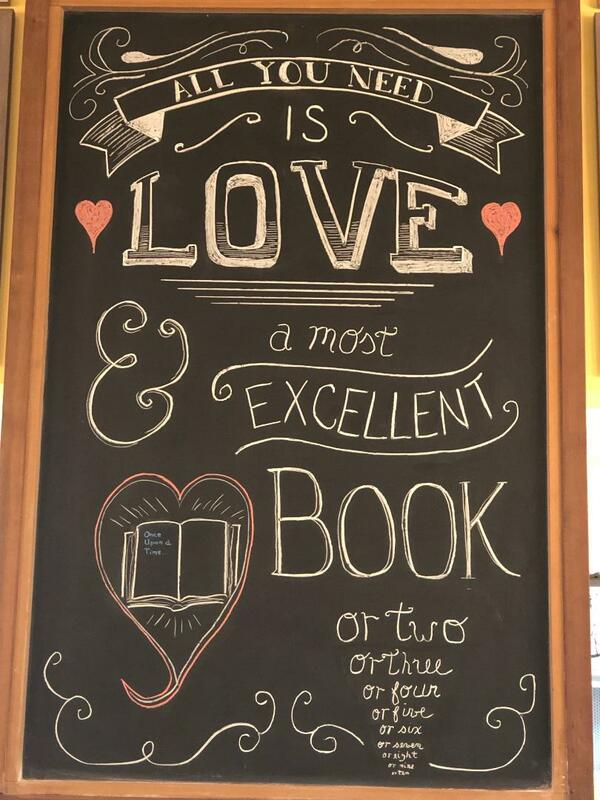 "
Little Shop of Stories in Decatur, Ga., shared a photo of the store's latest sidewalk chalkboard message: "All you need is love, a most excellent book or two or three or four or five or six or seven...."
Alyson Sinclair has founded Nectar Literary, a boutique publicity and communications firm that will work with publishers, authors, nonprofit organizations, and major literary events and book festivals. The three-person team includes publicists and event coordinators Alyson Sinclair, Mandy Medley, and Sarah Cassavant. Before starting her own publicity firm, Alyson Sinclair PR, in 2013, Sinclair was the publicity director at McSweeney's. She also worked as a publicist at Farrar, Straus and Giroux and a publicity & marketing manager at City Lights Publishers. Mandy Medley is soon leaving Coffee House Press, where she has been publicity director, and earlier was an indie bookseller at Unabridged Books and Powell's Bookstore in Chicago. Sarah Cassavant has worked with Alyson Sinclair PR for the past two years and joins the team as a publicist. She is also the events coordinator for the indie bookstore Subtext in St. Paul, Minn.
Donna Passannante, v-p & executive director, marketing, Crown Publishing Group, is joining the Penguin Random House Audio Group, effective February 4, as senior v-p, marketing & publicity. 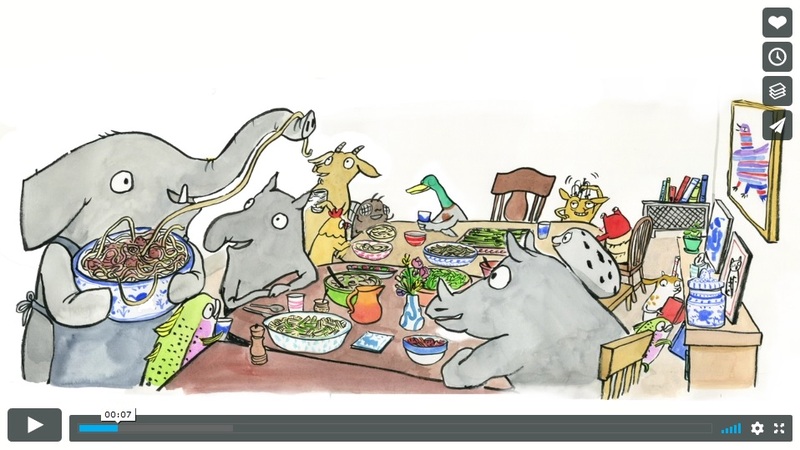 Noodlephant by Jacob Kramer, illustrated by K-Fai Steele (Enchanted Lion Books). Fresh Air: Sigrid Nunez, author of National Book Award-winner The Friend: A Novel (Riverhead Books, $16, 9780735219458). A new trailer has been released for the second season of American Gods, the Starz series based on Nail Gaiman's novel. Deadline reported that in the new season, "the battle moves toward a crisis point, as the destinies of gods and men collide. While Mr. World plots revenge for the attack against him in the first season, Shadow throws in his lot with Wednesday's attempt to convince the Old Gods of the case for full-out war, with Laura and Mad Sweeney in tow." The series stars Ricky Whittle, Ian McShane, Emily Browning, Pablo Schreiber, Crispin Glover, Orlando Jones, Yetide Badaki, Bruce Langley, Mousa Kraish, Omid Abtahi and Demore Barnes. The eight-episode second season, which is helmed by executive producer and showrunner Jesse Alexander, replacing Bryan Fuller and Michael Green, premieres March 10. 2 p.m. Brad Meltzer and Josh Mensch, authors of The First Conspiracy: The Secret Plot to Kill George Washington (Flatiron, $29.99, 9781250130334), at Politics & Prose in Washington, D.C. 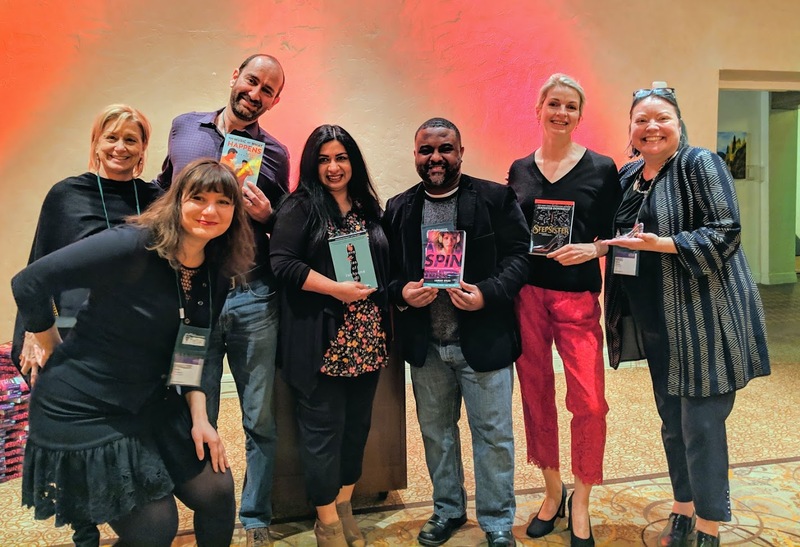 Seven shortlists have been unveiled for the Society of Authors' Translation Prizes, marking the first time shortlists have been announced for all the categories, "with the aim of sharing more of the exceptional works the judges have read this year." The 31 shortlisted titles include novels and graphic novels, poetry, art history, short stories, as well as modern and classic texts, in translations into English from Korean, Italian, German, French, Swedish, Spanish and Arabic. The £15,000 (about $19,600) in prizes will be awarded February 13 in London. Check out the complete shortlists here. Deep Creek: Finding Hope in the High Country by Pam Houston (Norton, $25.95, 9780393241020) is an essay collection about life on a 120-acre homestead in Colorado. House of Stone: A Novel by Novuyo Rosa Tshuma (Norton, $26.95, 9780393635423) takes place in Zimbabwe, where an odd lodger replaces a couple's missing son amid wider turmoil. The Plotters: A Novel by Un-su Kim (Doubleday, $25.95, 9780385544382) is a Korean crime thriller about a secret world of assassins. Reckoning of Fallen Gods: A Tale of the Coven by R.A. Salvatore (Tor, $28.99, 9780765395306) is book two in the Coven fantasy series. At the Wolf's Table: A Novel by Rosella Postorino and Leah Janeczko (Flatiron, $26.99, 9781250179142) takes place in 1943 Germany, where a group of women are conscripted to be Hitler's food tasters. The Twenty-Ninth Year by Hala Alyan (Mariner, $15.99, 9781328511942) is a poetry collection by a Palestinian-American poet and psychologist. The Love & Lies of Rukhsana Ali by Sabina Khan (Scholastic Press, $17.99, 9781338227017) features a young Muslim woman fearful of coming out to her conservative parents. King of Scars by Leigh Bardugo (Imprint, $19.99, 9781250142283) is the first in a new duology set in the Grishaverse. Let Me Finish: Trump, the Kushners, Bannon, New Jersey, and the Power of In-Your-Face Politics by Chris Christie (Hachette, $28, 9780316421799) is the world from the point of view of the former New Jersey governor. Mar-a-Lago: Inside the Gates of Power at Donald Trump's Presidential Palace by Laurence Leamer (Flatiron, $27.99, 9781250177513) dredges the history of Mar-a-Lago. Team of Vipers: My 500 Extraordinary Days in the Trump White House by Cliff Sims (Thomas Dunne, $29.99, 9781250223890) unpacks a snake's nest of political personalities. Try Common Sense: Replacing the Failed Ideologies of Right and Left by Philip K. Howard (Norton, $25.95, 9781324001768) argues for practicality over politics. The Lost Girls of Paris: A Novel by Pam Jenoff (Park Row, $16.99, 9780778330271). Vengeance Road (Torpedo Ink) by Christine Feehan (Berkley, $7.99, 9780451490148). The Water Cure: A Novel by Sophie Mackintosh (Doubleday, $25.95, 9780385543873). "Here's what they know: men hurt women, even if they don't mean to. And the island is the only safe place in a world that has been completely corrupted by pollution--at least that's what they've been told. So sisters Grace, Lia, and Sky occupy themselves with the painful rituals their parents have devised, exercises that will make them stronger and immune to love's sickness. Every day is the same until their father disappears and three strange men appear in his place. Violence is inevitable, but who will be the perpetrator? Gorgeously, perfectly written, The Water Cure luxuriates in an atmosphere of haunting, Atwoodian strangeness." --Lauren Peugh, Powell's Books, Portland, Ore. In an Absent Dream by Seanan McGuire (Tor.com, $17.99, 9780765399298). "Seanan McGuire's fourth installment in the lovely, spare Wayward Children series might be my favorite yet. Lundy is a returning character from the first book, and knowing how her story ends makes the journey to the end that much more poignant. This book, as well as the entire series, illustrates just how much we are defined both by the choices we make and the choices we refuse to make. Beautifully written, atmospheric, and just long enough to leave you longing for more, In an Absent Dream is perfect winter reading." --Chelsea Bauer, Union Avenue Books, Knoxville, Tenn.
Anatomy of a Miracle: A Novel by Jonathan Miles (Hogarth, $16, 9780553447606). "A priest, a doctor, and a reality TV producer walk into a convenience store... Actually, the notable walker in this story is Cameron Harris, a paralyzed soldier who inexplicably rises from his wheelchair and starts walking in the Biz-E-Bee parking lot. Anatomy of a Miracle follows Harris and the aforementioned sundry characters in the aftermath and dissection of this reported 'miracle.' Was it science? Was it divine? Was it a hoax? Will it make for a hit TV show? Jonathan Miles' charming--and often humorous--novel explores the varying perspectives on faith, truth, and the unexpected consequences of the miraculous." --Lelia Nebeker, One More Page Books, Arlington, Va.
Loving Hands by Tony Johnston, illustrated by Amy June Bates (Candlewick, $16.99, 9780763679934). "Loving Hands is a delightful book that shows how loving hands that caress, heal, soothe, and support can create strong mother-son relationships. Great for new mothers and grandmothers wanting to bond with their sons and grandsons. The soothing lyrical verse is enhanced by warm watercolor illustrations. Upon reading this, many will want to find small hands to hold and lead through life." --Candace Moreno, San Marino Toy & Book Shoppe, San Marino, Calif.
Angel and Bavar by Amy Wilson (Katherine Tegen, $16.99, 9780062671516). "What a great fantasy book for middle-grade readers! Bavar is full of magic, and he must keep the evil Raksasa from getting through the barrier. Angel is his catalyst, the person who is going to help him close the rift and make the Raksasa go back to where they belong. So very exciting and full of wonder. I enjoyed every minute of it." --Julie Poling, Red Balloon Bookshop, St. Paul, Minn.
Black Enough: Stories of Being Young & Black in America edited by Ibi Zoboi (Balzer + Bray, $17.99, 9780062698728). "Jam-packed with stories by rock star authors like Jason Reynolds, Nic Stone, and Rita Williams-Garcia, this anthology explores multiple ways of being black in the United States. The entries vary in themes and identities held, showcasing everything from gay and lesbian romance to police brutality to class divisions to issues of faith. The book made me laugh, cry, and think." --Christine Stamper, Bookbug, Kalamazoo, Mich.
Cover iconography that depicts a circus and story titles like "The Clown," "The Ringmaster" and "Strongwoman" might lead readers to believe a series of big-top tales awaits them in Mark Mayer's excellent short story collection, Aerialists. That, much like a circus itself, is a bit of a ruse. Mayer's characters and settings are various and multifaceted, sometimes linking up to the proposed theme of the work, and sometimes downright undercutting it. It's best to ignore the theme altogether and jump into these nine poignant tales about what one owes others, and oneself. Those looking for circus-themed literature will find it in "The Evasive Magnolio," one of the best stories in the collection. In it, the last human member of a town lost to the Dust Bowl during the Great Depression has to bury his elephant, a once-famous circus performer. It's an absurd setup for a story, but Mayer plays it straight, following the man as he explores the abandoned town and tries to figure out a way to commemorate his fallen pachyderm. What could have been merely comedic is a tragic tale of one man's connection to the creatures and landscape around him. "The Ringmaster," the final piece, is the most affecting, a somber story of a man nearing the end of his life with nothing to leave behind. Mick, a lifelong bachelor, has devoted himself to building an intricate model train set, hand-fashioning almost everything. He wakes up one day to realize it is finished, but with no one to give it to or to appreciate it, the model becomes a giant metaphor for his own impoverished life. That description might sound like Mayer closes on a sour note, but the author never loses his deep empathy for Mick, drawing the reader into his personal tragedy instead of reveling in it. That empathy is pervasive throughout Aerialists. Mayer is interested in men and women whose connections to their friends and family are strained and tenuous, and his stories explore how easily those connections can be repaired or severed. Most of the pieces in Aerialists are tragedies in one way or another, but they always feel genuine, brought on by mistakes and failures of character. Mayer is well aware of how easily things can go wrong, and how precious it is when they go right. --Noah Cruickshank, director of communications, Forefront, Chicago, Ill. 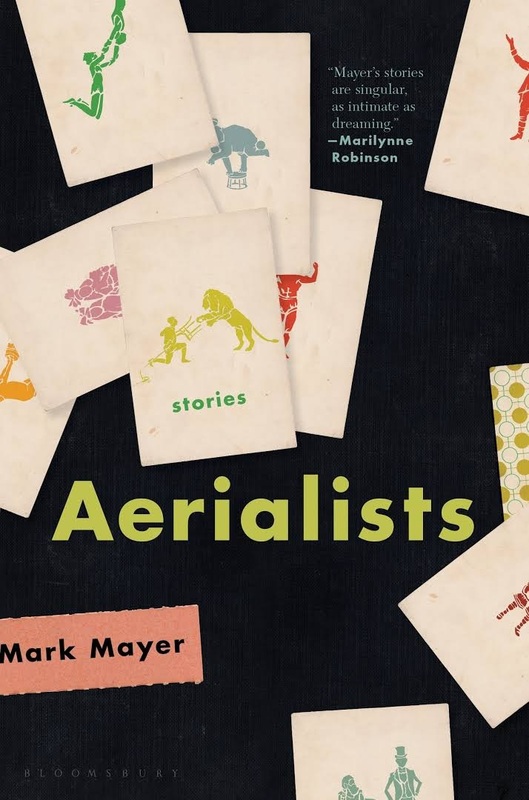 Shelf Talker: Mark Mayer's short story collection, Aerialists, expertly probes the tenuous connections between friends and families.